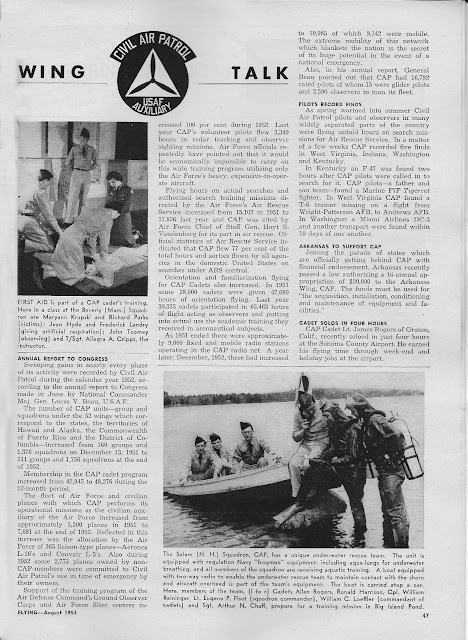 A while ago 1st Lt Eric Choate and his cousin were digging through old aviation magazines and found this gem about Civil Air Patrol, published in Flying magazine in August 1953! My, how times have changed. CAP had quite a few cadet members back then (over 48,000), not to mention airplanes: 7,681 according to the article, including 2,773 apparently privately owned by non-CAP members. It's unclear how many of the planes were, in fact, owned by CAP members; since that was more the norm then, it would have gone unremarked in the article. We do need more aircrew training: CAP had 16,783 rated pilots in 1953, although only 15 were glider pilots... hmmm. Today, we are doing better in some categories than in others! Who is attending the Mission Aircrew School this summer? If we had that many pilots in CAP, maybe we, too, could give 47,680 hours of O-Rides to cadets. And now the question: were any of you readers CAP members in the 50s? We know we have one 50+ year member in our squadron, but 60+ years... If anyone reading this was a CAP member in 1953, we'd love to hear from you! Thanks to Flying magazine's Managing Editor for letting us use the article in this blog.